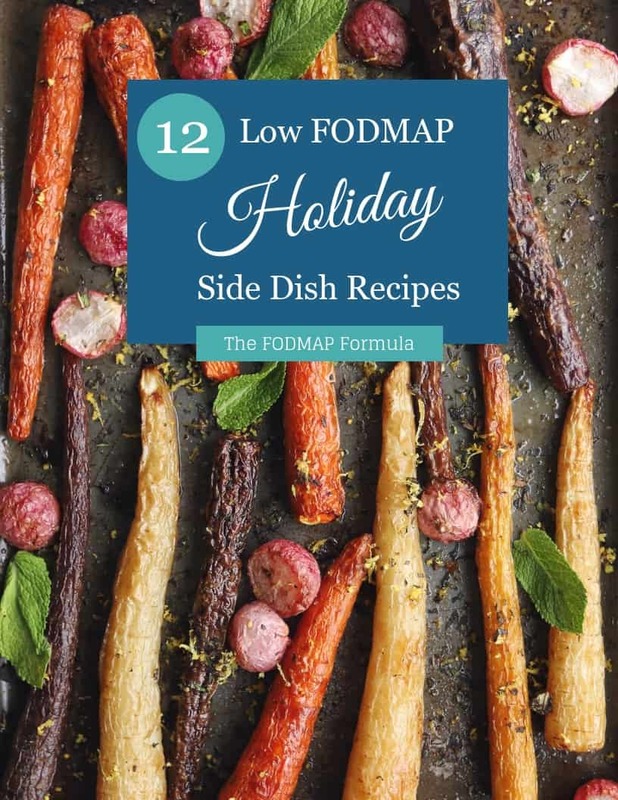 When you’re starting the Low FODMAP Diet, it can be hard to find quick and easy low FODMAP meals. If you need a recipe ready in under 30 minutes, I’ve got you covered. 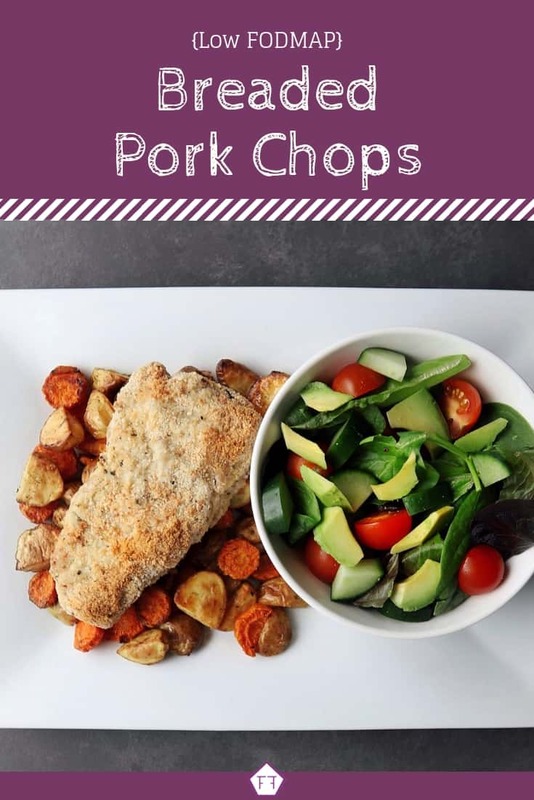 These cute little low FODMAP breaded pork chops cook in a flash and are absolutely delicious. My husband isn’t a huge fan of pork chops, so I save these for when he’s away. They’re so easy to put together, I don’t mind making them as a meal for one. I normally pair them with my seasoned carrots, because the seasonings work really well together and I can make them in the same pan. Think these low FODMAP breaded pork chops sound great, but you don’t have time to try them now? You can PIN THIS POST for later. These quick and easy low FODMAP breaded pork chops will be a family favourite in no time. Check out the notes below for tips on keeping this recipe FODMAP friendly. 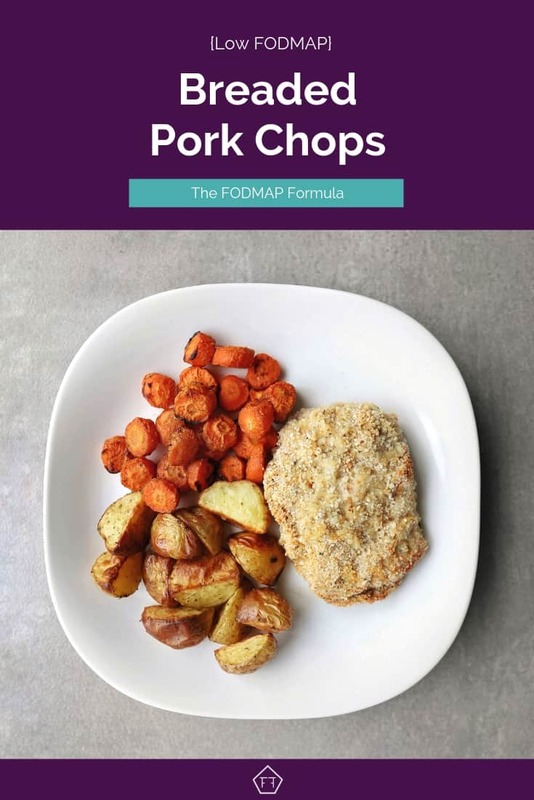 First, because pork is a protein, it doesn’t have any FODMAPs. But, there are some other ingredients we need to consider. Since this is a breaded dish, if you’re in the elimination phase, you’ll need to use gluten-free breadcrumbs. Make sure to check the label for sneaky high FODMAP ingredients (like chicory root (inulin), high FODMAP flours like amaranth flour, and honey). Out of bread crumbs? If I’m in a pinch, I toast two pieces of FODMAP friendly bread and send them through my coffee grinder. Remember to stick your toast in the fridge for 5-10 minutes before you grind it. This will remove any condensation and prevent soggy breadcrumbs. Next up is parmesan. Hard cheeses are low FODMAP in small portions. This is because bacteria eat the lactose during the fermentation process. According to Monash University, 1/2 a cup of parmesan cheese per sitting is safe. We use 1/4 cup of parmesan in this recipe, which works out to 1 tbsp of parmesan per serving. This is well within the suggested range. Finally, be careful when you choose your Dijon mustard. While 1 tbsp of Dijon mustard is fine, honey Dijon mustard is not. 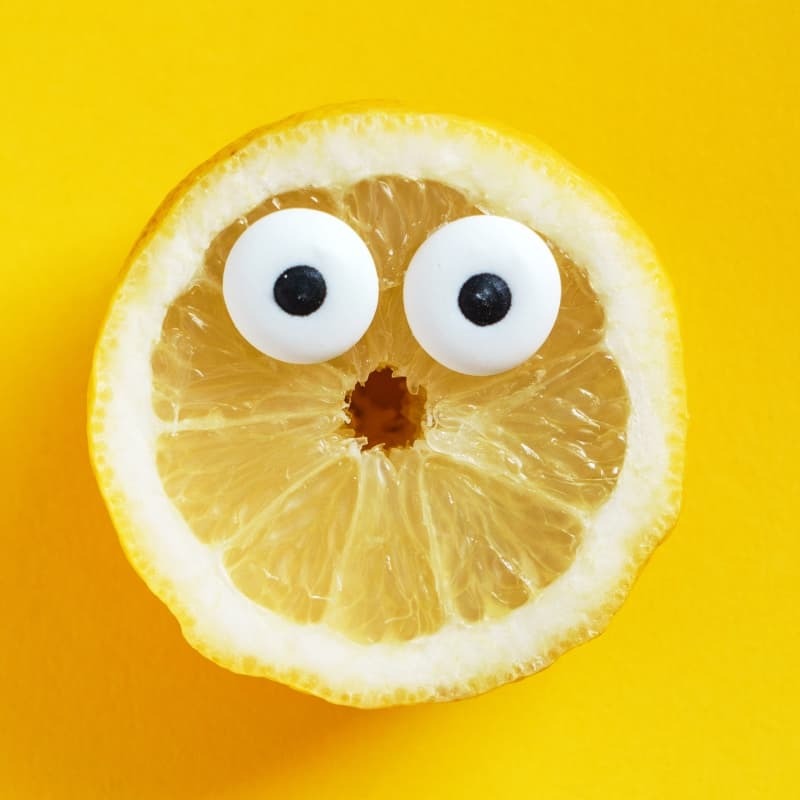 Honey is high in fructose and isn’t suitable for the elimination phase. So, make sure you double-check your mustard before you start. If you’re looking for a friend for your low FODMAP breaded pork chops, they taste great with roasted vegetables. If you want something a little fancy, you can try this roasted vegetable recipe or these chili-lime carrots. 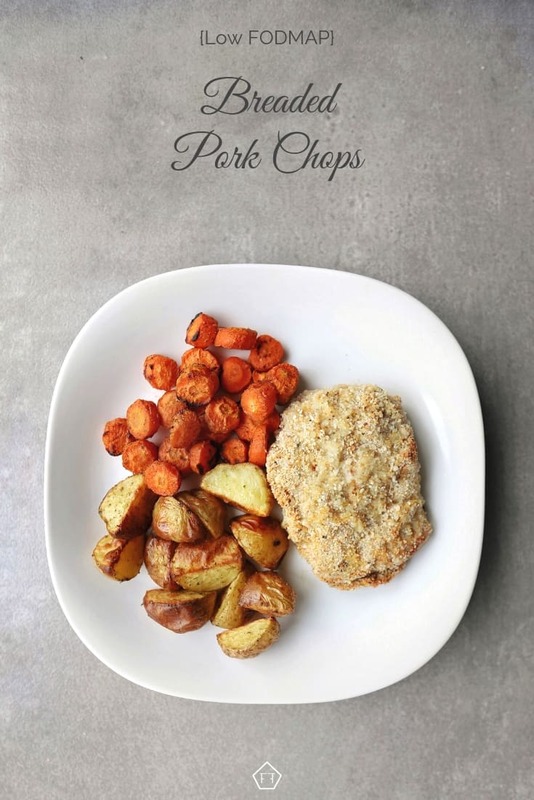 Want to try these low FODMAP breaded pork chops? Don’t forget to PIN THIS RECIPE for later. Looking for a quick and easy Low FODMAP Dinner? Try these low FODMAP breaded pork chops. They're prepared in the time it takes to heat up your oven and they cook in 10 minutes for a delicious stress-free dinner. Preheat oven to 450 degrees. Combine breadcrumbs, parmesan, basil and oregano in a small bowl. Pat each pork chop dry with a paper towel. Rub mustard over pork chops and sprinkle with salt and pepper. Then dredge in breadcrumb mix. Place breaded pork chops on a baking sheet lined with parchment paper and bake for 10-15 minutes (until pork is cooked through). Serve warm. These low FODMAP breaded pork chops will make dinner quick and easy. If you like this recipe, don’t forget to sign up for my mailing list below. You’ll get new recipes and articles delivered right to your inbox. Want more recipe inspiration? Follow me on Pinterest for even more FODMAP friendly ideas. Together we’ll get the diet down to a science! Next post: What is Irritable Bowel Syndrome (IBS)?